L’Atelier Imports was established about five years ago by Pete Johnson (of Tatuaje fame, of course) and several other partners to make “consumer price-conscious cigars.” The L’Atelier portfolio includes Surrogates, El Suelo, Trocadéro, L’Atelier Maduro, the original L’Atelier core line, and La Mission. La Mission debuted in 2015 as a tribute to Château La Mission Haut-Brion, a French winery of which Johnson is apparently a huge fan. While the winery is not connected to L’Atelier Imports in any way business-wise—and while Johnson even makes his own wines elsewhere (you can read a bit about that in this New York Times article)—this cigar line is named for Château La Mission Haut-Brion, and its vitolas commemorate specific vintages. There are seven La Mission formats listed on the L’Atelier website, each packaged in 18-count boxes and (with the exception of the torpedo) adorned with a pigtail cap: 1955 (6.75 x 44), 1959 (4.75 x 52), 1982 (6.1 x 52, torpedo), 1989 (5.6 x 54), 1999 (5.6 x 46), 2003 (6.25 x 48), and 2009 (6.5 x 56). 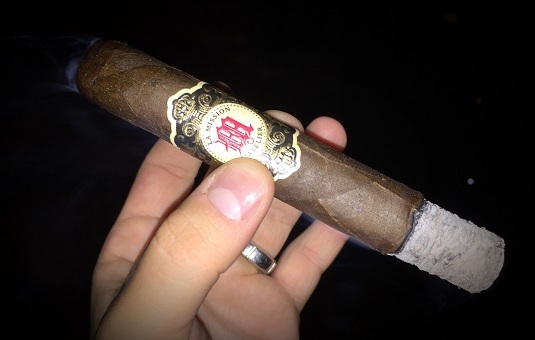 The blend recipe includes a dark Mexican San Andrés wrapper around Nicaraguan binder and filler tobaccos. Included is some Sancti Spíritus tobacco, which is a cross between Criollo and Pelo d’Oro that’s grown in Ecuador and featured in many L’Atelier cigars. La Mission 1999 retails in the $8-9 range and is characterized by a soft (almost oval) press. Its intricate band of cream, red, gold, and black gives the cigar a regal appearance despite the thick, toothy, rustic wrapper. The foot exhibits pungent pre-light notes of cocoa powder and barnyard. While firm in the hand, the cigar has an effortless cold draw once the cap is clipped. The initial profile is bold and full-bodied with a hearty dose of espresso, black pepper spice, dry oak, and cayenne heat. As it progresses, a smooth, earthy core emerges that has significantly less grit than I’ve come to expect from many other San Andrés-wrapped cigars. Into the midway point, the body mellows slightly to the medium- to full-bodied range with secondary flavors of dark chocolate, sweet cream, and black cherry. The texture is chalky. The final third, while cool, is characterized by a reprise of intensity with a focus on black pepper and espresso. Put simply, La Mission 1999 smokes majestically. You’ll be hard-pressed to find a cigar with superior construction. Expect an easy draw, ample smoke production, a straight burn line, and a finely layered white ash that holds very well off the foot. L’Atelier boasts a portfolio of fine cigars of which virtually any outfit in the industry would be proud to call its own. Yet La Mission 1999 may be the best L’Atelier to date. I would even encourage those who are typically put off by San Andrés (I know you’re out there) to give this standout specimen a try. It is a shining example of the depth, balance, and richness that can be achieved when the Mexican wrapper is blended properly. For that, it earns an outstanding rating of four and a half stogies out of five.